MoSER sinks and faucets are constructed out of pure type 304 austenitic stainless steel which unlike brass is 100% lead free. This stainless steel has 18% chromium content, a metal that is oxidation and corrosion resistant. The sinks and faucets also have high nickel content that provides strength and durability. The austenitic crystalline structure of the stainless steel allow the sinks and faucets to retain their shape and structure at all temperatures, from the cryogenic region to the melting point. Unlike other sink manufacturers that use thinner 20 or 22 gauge stainless steel to make their sinks, all MoSER stainless steel sinks are made with thick 16 or 18 gauge stainless steel and are manufactured with a full undercoating and noise dampening pads to provide exceptional sound deafening. The thicker gauge steel used by MoSER ensures that the sinks can more easily withstand impacts from everyday objects. 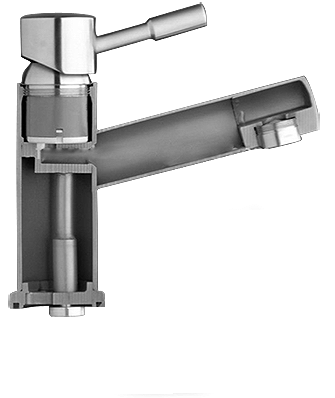 MoSER faucets incorporate the very best in ceramic cartridges and aerators. The ceramic cartridges are made and supplied by world leader Kerox, and meet the most demanding test and certification requirements worldwide, complying with relevant standards of EN, NF, ASME/CSA, ASSE, GB, and water-contact parts are approved by DVGW, WRC, NSF, ACS and ASNZS4020. The aerators are made and supplied by Swiss company Neoperl and have been tested and are ANSI/NSF61 and NSF listed. We are always happy to hear from our valued customers. For product support or other inquiries, contact us by one of the methods below. You can also use our website to look up product details, care and maintenance instructions, and find warranty information. © 2015 MoSER. All rights reserved.